Hamburg is the second-largest city in Germany (after Berlin) and the eighth-largest city in the European Union. The city is home to approximately 1.8 million people, while the Hamburg Metropolitan Region (including parts of the neighboring Federal States of Lower Saxony and Schleswig-Holstein) has more than 4.3 million inhabitants. 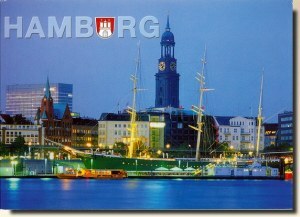 The port of Hamburg is the second-largest port in Europe (after that of Rotterdam), and the ninth-largest in the world.